After finishing the Rally and spending sometime chilling out in Ulaanbaatar, it was time to head out to China to do a little sightseeing before heading back to Blighty. In a first days we visited most of the major sights in and around Beijing, including Tianamen square, the forbidden city and of course the great wall. Now I’m back in England with sensiblily speedy internet (and allowed access to blogger) I can upload a selection of pictures! Walking on the great wall! From Xian we set out to see the terracotta warriors, I hadn’t realised this is still an active archaeological dig. The warriors themselves are really quite impressive although I wasn’t fond of the 2km hike though tourist-tat-sellers we had to pass by to get there. Every day we pulled in for various excursions to temples, side gorges or markets, as the only white people on the boat we frequently got asked to have our picture taken with the other folks on the boat! The final stop was the three gorges dam near Yichang, as the largest hydro power station in the world it is quite an impressive sight. I remember learning about this project for geography GCSE and therefore was a little bit aware of some of the controversies that surround it. Of course none of this is displayed at the dam site itself which talks about the construction of the dam ‘increasing the magnificence of the gorge’ and dam completion achieving the ‘cultural and social aspirations of the Chinese peoples’. After the cruise we headed back to Beijing on the overnight train to spend our final day looking around the Temple of Heaven before setting off to the airport to catch our flight. Too many hours later (including a 4 hour delay at Doha), we arrived tired and worn out in Heathrow, after a fantastic two months! One night while in the pub with my Ukulele, before the rally started, I met Stefano. As with everyone I met this year I regaled him with our plans for the rally. Right there and then, not knowing me Adam, Stefano asked if he could help out. What a lovely guy. what we were on about was no mean feat! A big thank you to Carlyn and the team at Preferred Communications. They provided us with a satellite phone for the trip and they were an absolute pleasure to work with. In the end several teams benefitted from our satphone and fortunately it was never needed to call in any emergency services! We provide equipment, airtime service and installation and are an authorized dealer for many of the world's leading satellite service providers." 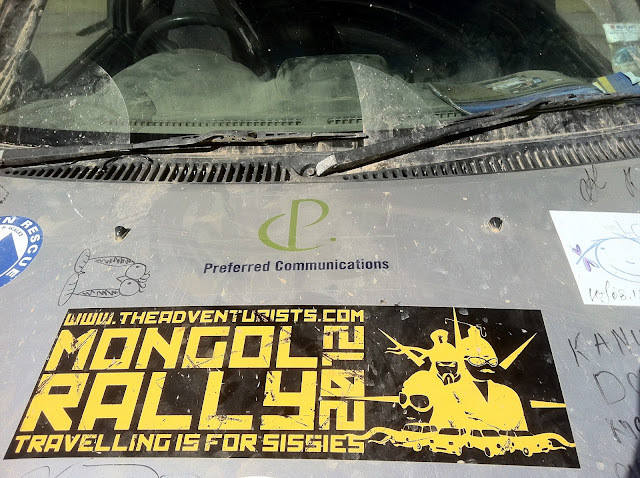 Having left Oglii we carried on through Mongolia’s dirt roads to get to the next town Altai there is a mechanics and a drop off centre there where which are listed on the Mongol rally guide. As we passed through we looked on smugly at the other teams having car trouble and our convoy team headed off into the desert. Some 40km out of town, Red Dog Racing hit a roack which punctured both their sump guard and the sump. If (like me before this trip) you don’t know what a sump is be assured it is a vital piece of car. With oil spilling onto the desert there was no way Red Dog were going anywhere with out our help. This is how I found myself doing my first ever car tow on a potholed sand track in the desert, while team Infinity scouted the route. Returning to the garage in Altai was pretty depressing however the mechanics there pulled off some mechanical wizardry to fix the sump. After this we noticed the engine mounts on Red Dog’s car had also sheared and more work was required to get them back on the road. With a schedule to meet, we left Altai with team Infinity hoping Red dog would catch us up in a couple of days. Once we were back in the desert Beverly was motoring along and unfortunately hit a ditch too hard. As we jumped out of the car and saw oil spilling onto the sand we feared for the worse. Being over 100kms from the nearest town it would be a long slow tow if our sump was broken. As it turns out the sump was intact, just the oil filter had broken. This would have been equally catastrophic if it hadn’t been for Ant’s genius buying of a spare oil filter before we left the UK. Ben (from Infinity) and I set about making emergency cups of tea, whilst the other fitted the spare filter. Without losing too much time we were back on the road again. A few hours later checking our map against our co-ordinates we appeared to be off course, however according to another map we were exactly on course. With the road getting worse there was some debate about which was the best way to go, but eventually decided to stick with the road we were on. 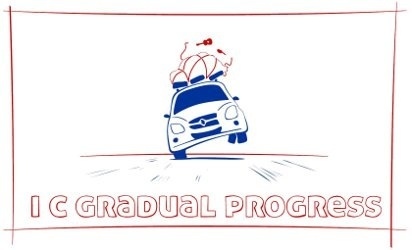 Progress was pretty slow due to the condition of the road however noticed that Infinity’s car was moving much slower that us. Having pulled in behind them we noticed that their rear wheels were splayed, we flagged them down jacked them up and checked under the car. The axel support was fractured and their rear wheels were in danger of falling off. This was not something that could be fixed easily, while we were pondering the best course of action, team Red Dog appeared out of the desert. We were so pleased to see them again as well as reuniting our convoy team it meant we could get Matt’s opinion on Infinity’s car. I’ll use this point to add a big thanks to Matt from Red Dog, as a super trained mechanic he’s been magically fixing up all our cars since our convoy team met back in Astrakan. Unfortunately this break was not one that could be fixed with cable ties or duct tape, the best course of action was to limp on at 10mph and hope Infinity’s wheels stayed on until we got into the next town. We stuck with them on the road so we could help out in case the car terminally broke down, we decided to ignore the Adventurists advice and drive into the night at 10 mph you can avoid every pothole and bump in the road. We got to a river crossing at 11pm where we camped for the night. The next day we had to get towed across the river by tractor , fortunately Beverly’s air intake was quite easy to access and raise up, so we didn’t flood the engine. Some slightly too fast driving from one of the tractors meant that Red Dog’s engine got water in it, and we still had Infinity’s broken car to fix. To cut a long story short Uber Faff ensued, but at the end of the day Infinity’s car was in the garage being welded back together and Red Dog were also still rolling. To make the most of the fading light we split with the convoy and headed into the final stretch of the Gobi desert. We awoke at the crack of dawn to get going as swiftly as possible, if all went to plan we could reach UlaanBaatar that evening. A few hours into the drive we heard a bad crunching sound from the back of the car. A speedy jack up revealed that once again we had broken a suspension spring, more cable ties were added we rallied on. The stereo was cranked up to drown out the noises coming from Beverly. Once we got closer to Ulaanbaatar the roads turned to tarmac (with varying amounts of pothole) and our speed dramatically increased. We made it in to the finish line at about 8pm, we were pleased to be there but having received a text from the rest of our convoy we found that they were only 3 hours behind us we only stopped off briefly before getting back on the road to surprise them on the way in so we could all roll in to Ulaanbaatar together in triumphant celebration. Since arriving we’ve now handed over our car keys so they can be sold for the charities, it’s interesting to hear that the cars are worth more here than we paid for them in the UK in spite of all the damage we done to them over the last 6 weeks. A big thanks to Ravi, Harvey and Ben from ‘To Infinity and Baatar’ and also to Adain, Matt and Rich from Red Dog Racing, we had the best fun convoying with you guys! I’ll add some more pictures later, when we have better internet, and also some posts on all the things we didn’t say whilst on the road so as not to worry various people. After getting some new suspension springs fitted, Beverley (did I mention we named the car Beverly?) now has a much smoother ride and is ready for the Mongol roads, which is good because that is where I am writing this from! After leaving Almaty we rejoined Red Dog Racing, briefly rescuing them from a flat battery situation, and made a large dent in the distance through Kazakhstan. Since we were cutting it close with some peoples Russian visas we opted for the fast road through the country without stopping for much more than fuel. We had intended to camp just short of the border however a friendly policeman found us searching for camp spots and escorted us to the nearest hotel, probably out of concern for our safety. Unfortunately the hotel only had one double room left, so we managed to squeeze all 7 of us into the double room… cosy. The next day we successfully re-entered Russia, where we were reunited with ‘To Infinity and Baatar’ after leaving them in Kyrgyzstan. 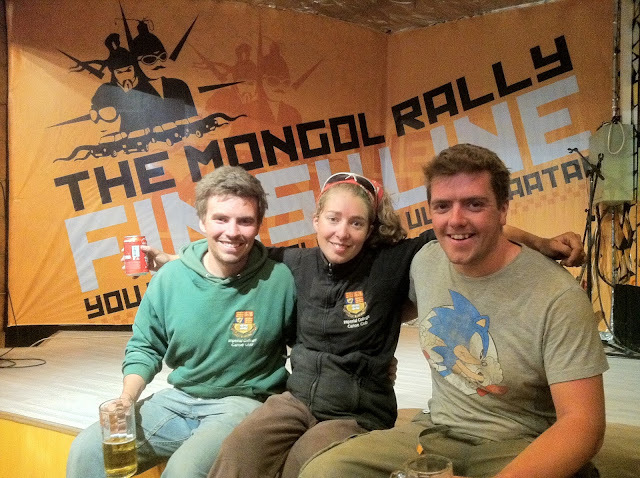 Team convoy reunited, we headed for the Mongolian border arriving at about 6pm. Leaving Russian was reasonably straight forward, my folder of organization paid off when they wanted to see some of our old Kazak documents. The No-mans-land between Mongolia and Russia is quite spectacular with rolling grass hills, since we didn’t expect to make the Mongolia side in time we were looking forward to camping there. However when we reached the Mongolian side we were ushered into a concrete holding pen where we found several other team waiting for the border to re-open in the morning. Sadly we have no photos of this due to border restrictions. The main hold up at the Mongolian border is just for the car paperwork, so we were allowed to walk into the border town to buy dumplings and change money etc. After a somewhat chilly night camped on the concrete we got underway with our paperwork and queuing finally being allowed across at 3pm, some 21hours after arriving. We left just as the rain turned into snow, the road conditions where no too bad however and tonight we find ourselves staying in a ger in the town on Olgii. It feels pretty good to have finally made it to Mongolia, we’re not sure how regular the internet will be over the next few day but we’re hoping to make the finish line party on the 24th August if there are no major beakdowns between now and then. Since our last post 90% of the convoy have lost partial bowl control, this lead to some speedy emergency stops by the side of the road, such is the nature of foreign travel. Anyhow shortly before we hit the border we sheared our rear left suspension spring such that it was rubbing against a part of the car. With a little help from Red Dog Racing we fixed the spring back into place using about 20 cable ties. We gingerly carried on, with confidence in our fix growing with each mile. It turns out you can literally fix anything with cable ties. Leaving Uzbekistan proved to be a bit more challenging than entering as the border guards did not seem to be in the mood to do any actual work. By contrast the Kyrgyzstan side of the border was super quick and friendly. The next day we headed over the Kyrgyz mountains towards the capital Bishkek, this turned out to be my favourite drive of the trip so far. The roads were levelled and tarmaced meaning we could enjoy the mountain landscape passing by. Inevitably it wasn’t long before I got pulled over for speeding, however in a masterful display of smiling and ignorance we got away without paying any fine. Our little convoy briefly grew to 5 cars before dropping down to 2 as we parted ways heading for different borders. We’ve also got and extra person in our convoy team as we picked up another rallier who’s car has died. We intended to drive around the edge of the Issy-Kul lake in Kyrgyzstan and then head up over the border into Kazakhstan. Unfortunately when we arrived at the border we found the Kazaks had closed the border a couple of years ago - Doh! We turned around and headed back to Bishkek to cross the main border into Kazakhstan. We are now in Almaty (the old Kazak capital) getting our suspension springs replaced.